Carlynne Hershberger is a Charter and Signature member of the Colored Pencil Society of America and is past president of the Florida chapter. Her artwork has won numerous awards and has been recognized at the CPSA Annual International Exhibition and the Cornell Museum exhibition Points of Color. 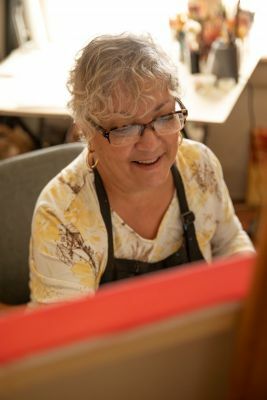 Her work has been seen in The Artist's Magazine, Pastel Journal, American Artist Drawing, the North Light books Colored Pencil Explorations and Sketchbook Confidential 2. She is also co-author of Creative Colored Pencil Workshop. Born in 1958 in Jersey City, New Jersey, Carlynne grew up with the influence of artistic family members. She especially recalls the smell of turpentine when visiting her great uncle. "I could see the luscious paint mixtures on the palette, smell the oils and turps and was fascinated by the whole set up" Her grandfather was also a great motivator for Carlynne. He was always moved to share stories, music and encourage any artistic interests. "He used to give me the Sunday funnies to draw from. His favorite was Felix the Cat. I drew many of those for him." In 1972 her family moved to FL where she still lives. Her father, being raised in Cuba, had had enough of the cold and snow and was ready for more tropical weather. Although she no longer lived near her grandparents they still had a profound effect on her and her pursuit of an art career. Throughout school her favorite classes were art classes of course and in high school she was able to take 2 years of commercial art and then followed it with a major in fine art in college. After graduating from the local community college she went on to the Art Institute of Ft. Lauderdale where she majored in fashion illustration. "I wanted to be another George Stavrinos. He was an amazing illustrator" After leaving the art institute and working in advertising it became clear to Carlynne that her heart just wasn't in the commercial art world. She belonged to fine art. When she married and started her family Carlynne was able to raise her children and continue working on her own, honing her skills and developing her art career. Her main focus for many years was working in colored pencil doing very realistic landscapes and florals. One day she saw a letter to the editor in the Artist's Magazine. It was written by an artist named Vera Curnow wondering if there were any other colored pencil artists out there. She wrote to Vera along with many other cp enthusiasts and thanks to Vera taking the reins, the CPSA was born. Carlynne became a Charter member and later a Signature member of the Colored Pencil Society of America. After more than 20 years of working exclusively with colored pencils, Carlynne was ready for a new challenge. Colored pencil can be detailed and time consuming work and she was itching to loosen up a bit. It was time to pick up a brush again and play with something new. She started by combining other media with colored pencil such as watercolor, gouache and ink. From there she began working with acrylic and oil on canvas and experimenting with mixed media. The media may have changed but the inspiration and subject matter remained the same. Nature and it's many shapes, textures and patterns continued to inform her work including the abstracts. Trees are the main focus of many of her landscapes while satellite images and aerial views of earth are the inspiration for the abstracts. Although she mainly wields a brush nowadays, she still loves her colored pencils. There are many colored pencil filled coffee cups lining the shelves and the drawing board in her studio. "I'll never abandon my pencils. We go back a long way." Her favorite way to use them now is to produce portraits of children and pets. "I love getting a commission, taking a photo that the client provides and bringing it to life for them. It's also where I get to go back to my cp roots and enjoy the detail and control only a pencil point can give". A more recent development in her artwork is the symbolic series. This group of paintings is called Silent Voices and it's a very personal project for Carlynne. They tell the story of adoption from the first mother's point of view. They represent the spiritual and physical connection that women have with their children and what happens when that connection is lost at birth. Carlynne is a mother of adoption loss. She was sent to a maternity home and forced to surrender her first born to adoption at birth, and in this series each painting represents a moment in time, one aspect of living with adoption. This series has been in the making for several years and will continue to grow as she adds to it. She recently had her first showing with this work in Macon GA. Whether the work is about painting nature, children or stories about adoption, Carlynne pours her heart and soul into whatever she's working on in that moment. "There's nothing like being in the zone, doing what you're called to do. For me that means making pictures about life and life is about nature, the people you meet and the stories you have to tell."